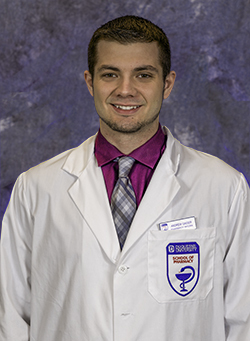 Mylan School of Pharmacy student pharmacist and Honors College student, Andrew Gaiser, recently received the Liberal Arts Endowed Fellow Award. In conjunction with the award, Gaiser will receive additional funding to further his research project, which is entitled, "A Sociohistorical Analysis of the Proclivities of Japanese and American Populations Towards Health Care Systems and Policies." "As a part of my research, I will be attending the Pharmacy School's trip to Japan this summer for two weeks, to get a first hand experience with the Japanese health care system," explains Gaiser. Dr. Khalid Kamal from the School of Pharmacy and Professor Cimakasky from the Philosophy Department are assisting Gaiser as project mentors. Honors College students have the option to continue pursuing additional honors course work through the Honors Fellows Program.